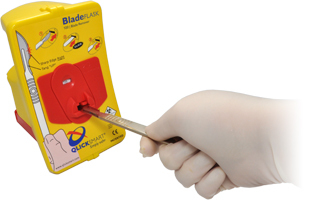 Qlicksmart BladeFLASK provides a simply safer way to remove and contain used scalpel blades. 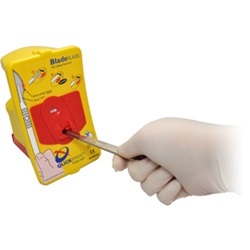 This world-first single-handed scalpel blade remover prevents the dangerous injuries commonly caused by removing blades with fingers, forceps or re-sheathing. Comes red in color and holds up to 100 blades. Compatible with handles: #3, 3L, 4, 4L, 5, 7, 9, Lawton long handle and blades: #10, 10a, 11, 12, 13, etc. up to and including #25a, 27 and 36. Comes 12 per box.